On the far side of the bar a band are playing. In front of us, a smartly-dressed woman dances unsteadily, occasionally lurching towards us. But put out a hand to steady her, and it goes straight through. We're in the Immersive Virtual Environments Laboratory at University College London, where researchers are looking at how to make people engage with characters inside a virtual environment, and exploring how virtual reality could be used to help train people to cope with real world difficulties. The research carried out by Professor Mel Slater and his colleagues has shown that people react in virtual reality in a way similar to real life - and far more so than would happen just by showing a video or asking them to imagine a situation. "In these virtual environments most people find themselves surprised at how much they respond to virtual characters even though they know they're not real" says Prof Slater - an observation which certainly chimes with our experience. Back in the bar, a fire has broken out. At first, no-one seems to notice but eventually, everyone screams, and runs towards the exit. 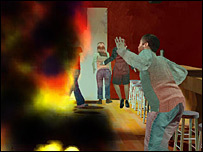 This is an experiment examining how people react to danger in a virtual environment, with the eventual goal being to create a scenario which could be used in training for emergency situations. "One of the key advantages of virtual reality is that you can do things inside that you just can't do for practical or ethical reasons," says Prof Slater. Much of the UCL work centres around exploring the factors which give people a sense of "presence" within a virtual environment. "If you want to believe in a character there are things that they have to do correctly, otherwise no matter how graphically realistic they are, it just won't work," says Dr David Swapp who manages the laboratory. For example gait is important when people are moving around the virtual space, whilst in close conversation it is the eyes that researchers have to get right. "You want them to maintain eye contact with you to a certain degree but you don't want them to stare, and you pick up on the subtleties of this very easily - if it's not right then you can notice very quickly," he says. The research takes place in a room called the CAVE - where stereo images are projected onto three walls and the floor. Inside, the participant wears a pair of shutter glasses, which flicker on and off 90 times a second, so the left images are seen by the left eye, and the right images by the right eye, creating the illusion of 3D objects. So, the chairs look very inviting, and the virtual characters can move past you and even invade your personal space. On top of the shutter glasses is a small head-tracking unit, to allow the projections to be continuously updated from the users point of view - as a participant moves around the room, the image they see will always be perspective correct. The main application of the UCL work thus far has been various kinds of clinical psychotherapy. We are shown scenarios to aid people with a fear of public speaking and told about experiments which examine different levels of paranoia. "It's a controlled environment" says Professor Slater. "We can have a psychiatrist standing next to someone monitoring them - you couldn't do that in real time, you couldn't follow them around for a week to see how they behave - it's a perfect lab setting". 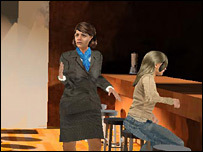 But the virtual environment which most captures our imagination is another virtual bar, a situation where shy men can engage in conversation with a forward woman - which Professor Slater hopes will help people with social phobias. Participants are continuously monitored when inside. "We conducted one pilot study and the subjective questionnaire and interview responses showed that shy men become very anxious in this environment," he explains. "But after a few minutes their heart rate comes down and they start to relax - which holds good hope for the training of people with this kind of problem". Therapy for various kinds of phobia is a common use of virtual reality, but it is social phobia and the exploration of interactions with people which most interest Professor Slater. "It's technically more interesting and I think also more important in some ways. You can have a fear of bridges - and so you don't walk across a bridge, but if you have a fear of people, life is very difficult". Click On can be heard on BBC Radio 4 at 16.30 on 22 October and on Listen Again for a week after broadcast.